The rector, parish staff, seminarians, vestry, and ministry coordinators of St. George's work together in collaboration with the congregation to carry out St. George's mission to worship God and share our faith through word, action, and service. Kevin was born and raised in Brenham, Texas, and often visited the "big city" of Austin as a child. He attended Texas State University; after receiving his bachelor's degree in anthropology and history, he served as an archeologist for Texas State until 2001. He moved to Houston in 2001, where he met his wife, Heather, and served as Director of Ministries at St. Andrew's Episcopal Church. Following a call to ordained ministry, Kevin returned to central Texas with Heather to pursue his master's degree in divinity at the Seminary of the Southwest. He was ordained in 2007, and his first parish assignment was at St. Matthew's Episcopal Church in northwest Austin. Since May 2010, Kevin has served as rector of St. George's, which he describes as a "loving, compassionate community" and considers part of his own family, which now includes two sons, Holden and Harper. When he's not wearing his collar, Kevin often can be found canoeing down the waterways of central Texas or playing percussion in two bands, The Naughty Pines and Two-Day Suitcase. 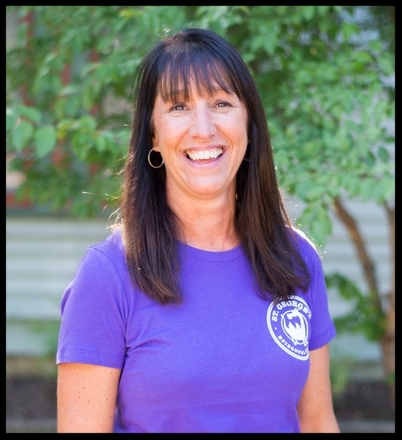 Jerri Thompson began her new role with St. George's School in the spring of 2014 and brings 30 years of experience in early childhood education to the position. Jerri formerly taught in the Child Development Department of Houston Community College and developed "Scope and Sequence" for infants through kindergarteners, an assessment tool for teachers and parents. Jennifer began working at St. George's in November 2015 and brings many years of experience in Episcopal churches and non-profit organizations. She moved to Austin from Berkeley, California, and lived in Boston prior to that. She's thrilled to have the opportunity to put her interest in and knowledge about church life to use here at St. George's. When not at work, she spends most of her time with her husband and two young children, who keep her very busy! Lauren is a Senior at the Seminary of the Southwest and a Postulant for Holy Orders from South Carolina. She has a passion for living into and sharing the Gospel message of Loving God and Loving Neighbor, which has led her into an ever-evolving ministry in social justice in recent years. She's from “all over,” and she's learned to find home wherever God takes her (and her two cats). She is excited to be serving with St. George’s as her seminary field placement. Nelson was born in The Philippines and raised in southern Virginia. He has a passion for social innovation, young adult/professional empowerment, civic engagement, and service leadership. He has worked for ONE Community, an LGBTQ+ and allied organization, and for the Asian Pacific Community in Action. He is a Middler at Seminary of the Southwest, where he has chaired his class council, is working to create a gathering space for seminarians of color, and serves as the campus photographer. His ministry is governed by his belief in the Gospel’s Call towards justice; one of his favorite quotes is “Justice is what love looks like in public,” by Cornel West. When not busy writing papers or reading for classes, he enjoys going on adventures and exploring new places, playing video games, and exploring new ways to practice self-care. Bryan Callen is a second-year M.Div. student at the Seminary of the Southwest. He is originally from California but has lived in and around Reno, Nevada, for the past 10 years. His wife Jeri is a Professor of Occupational Therapy at a private health college here in Austin. They have four daughters: Brynn who is seven and in first grade, Elliot who is six and in kindergarten, Nola who is four and is in pre-school here at St. George’s, and Dillon who is two and also at St. George’s. Before coming to seminary Jeri was in clinical practice as an occupational therapist, and Bryan was a stay-at-home dad for six years; prior to that, he was a teacher for a brief time.